For those spending Thanksgiving in Venice, Italy should not pass up an amazing opportunity to have your Thanksgiving dinner at the the luxury BAUERs Il Palazzo hotel. This ultra-luxury hotel in romantic Venice, Italy is offering a fabulous American-style Thanksgiving dinner, created by Chef Hiraki Masakazu, the celebrated chef at the hotel’s De Pisis Restaurant. The Thanksgiving dinner will be served on Thursday, November 24th and will offer patrons an incredible dinner menu that celebrates American Thanksgiving cuisine with an international flavor. Visitors from all around Venice, Italy plus the world are invited to enjoy this delicious Thanksgiving feast. Make it a special holiday time with friends and family. The luxury BAUERs Il Palazzo hotel is the ideal place to stay while in Venice. It’s an intimate boutique hotel, centrally located Venice. 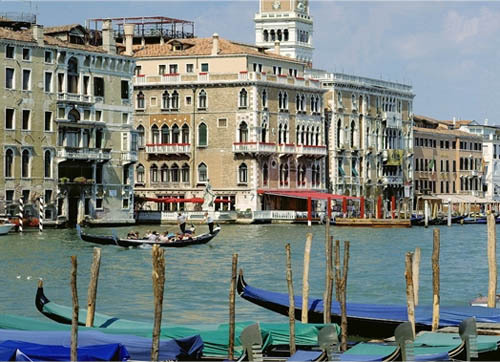 It offers a truly authentic, Venetian-style experience and overlooks the world famous Grand Canal. Chef Masakazu initially started his career in Italy 12 years ago, when he left Tokyo to immerse himself in the history and culinary traditions of Italy. He is now the Executive Chef of De Pisis Restaurant, which serves the ultimate in fine dining. The Thanksgiving will consist of baked ham glazed with apricots and mustard and, plus roast turkey stuffed with dried fruits. Who doesn’t love dessert. This fine meal will appropriately end with an American favorite – apple crumble. Price is Euro 90.00 and VAT included. Please note that beverages are excluded. The Il Palazzo hotel is nearby St. Mark’s Square and close to Venice’s finest shops, museums and various sightseeing spots. This Venice landmark hotel is much more than a basic hotel. The BAUERs Il PalazzoIt’s both elegant and luxurious and features a stunning Gothic facade. If you would like to enjoy this amazing Thanksgiving dinner at the BAUERs Il Palazzo in Venice, Italy, then please contact The Life of Luxury. We can handle all of your travel arrangements.